Blisslights Spright the Perfect Choice for the Holiday! Outdoor Laser Decor! The BlissLights Spright is our most popular product. This unique lighting experience projects thousands of static pin-points of light that is perfect for a “fire fly” effect in your garden or creating a truly unique holiday display that will amaze you and your neighbors. The Blisslights Spright Green is our most popular color and can be used on any surface indoors or outdoors. It looks amazing on trees and plants by create that magical “firefly” glow in your backyard for a truly amazing lighting experience. Let your imagination make you into an instant lighting designer with our color options. Use only one color or combine the colors to create the effect you wish. The Blisslights Spright Blue transforms your pool, house, or any other surface with its thousands of pin-points of light. Let your imagination make you into an instant lighting designer with our color options. Use only one color or combine the colors to create the effect you wish. The Blisslights Spright Red with its softer, more subtle red starry-glow of light is perfect for indoor use to transform the mood of any room or simply to create a touch of bliss anywhere you need outdoors. Let your imagination make you into an instant lighting designer with our color options. Use only one color or combine the colors to create the effect you wish. The BlissLights Spright Move uses laser and holographic technology to project thousands of moving pin-points of light. Just plug-in and point to create a truly unique lighting experience. No longer are the lights static and you can see the “fireflies” dance in your garden or add extra allure to your holiday display! Indoors or outdoors, the possibilities are endless! Change the look and mood of your outdoor décor with a click of a button! 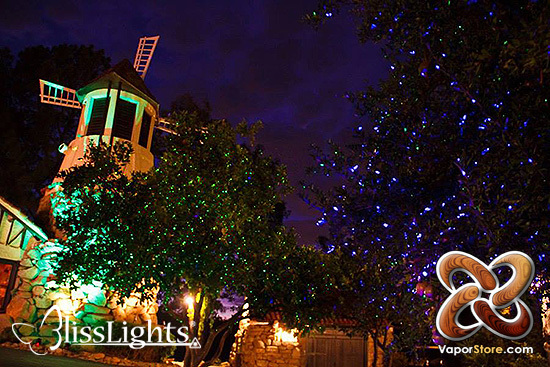 The low-voltage BlissLights Garden Accent Light has a higher standard than other flood lights in the market. The 16-color LED floodlight is perfect every day use, Holiday lighting effects, and a great complement to all BlissLights products. The BlissLight Projectors and Blisslights Spright laser projectors offered with the green and blue laser options is the newest innovation available from BlissLights. The Blisslights Spright is ideal for your outdoor decorations whether you are decorating for the holiday season or a summer time party. The Spright is easy to use – just plug it in and point it – and the Blisslights Spright will project a static starfield of pin-points of light onto your trees, house and or yard. Put the Spright on a timer and have them turn on and off so that you dont even have to think about them. Instant Holiday Decorations in less than 5 minutes! Police and FBI agents earlier this month employed a novel technique to catch a Northeast Portland man accused of pointing a high-powered laser beam at airliners descending into Portland International Airport. Agents and Portland police flew airplanes over the vicinity after dark in August to draw the attention of the person responsible for aiming big green beams at the cockpits of airliners, causing extreme danger to air crews and passengers, according to an FBI affidavit unsealed Thursday afternoon in U.S. District Court. When the beam struck one of the investigation team’s planes, police and FBI agents drew a bead on the locale where it appeared to originate, Special Agent Jake Green wrote in the affidavit. Then they secretly installed surveillance cameras outside an apartment on the city’s northeast side. 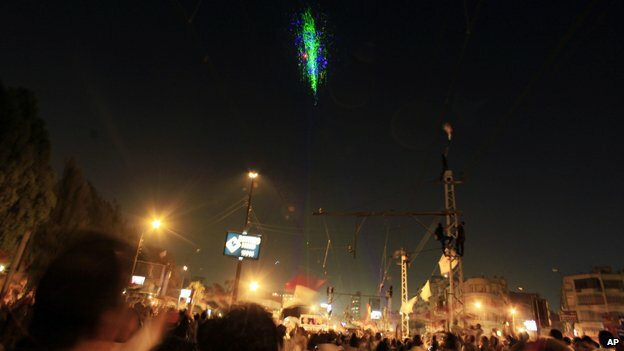 Egypt crisis: Why are Cairo protesters using laser pens? As crowds packed Tahrir Square in the centre of Cairo to celebrate the overthrow of President Mohammed Morsi on Wednesday night, three things filled the air – noise, fireworks and, unusually, laser beams. The use of laser pens has become a distinctive feature of the protests against the country’s leadership, which began at the end of last month.